Access our powerful interactive online tool, enabling you to perform your own custom analysis of the full survey data set. For organizations needing to take a deep dive into The BI Survey data to examine market trends and product comparisons in detail, we provide The BI Survey Analyzer. The BI Survey Analyzer is a powerful, interactive, online tool that enables you to perform your own custom analysis of the survey data. 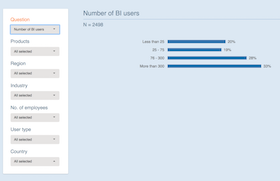 Visit BI-Survey.com to try out the free (limited) version of The BI Survey Analyzer. The BI Survey Analyzer allows you to analyze the survey data in numerous ways. You can even export your findings to share with colleagues. With all the above analyses, you can use The BI Survey Analyzer’s filtering capabilities to access the results most relevant to you. Results can be filtered by region, country, product, industry and company size (number of employees). One of the outstanding benefits of The BI Survey Analyzer is the ability to filter the survey data by your own customized list of products. This feature lets you focus on the results of products that you want to evaluate and make quick comparisons between those tools. This will help you to eliminate unsuitable products from your shortlist and home in on the tools that match the requirements of your organization. Click here to see the list of products included in The BI Survey Analyzer.